This is a beautiful re-imagining of a small section–a screenshot, if you will–of World 1-1 of the original Super Mario Bros. on the NES. It’s not very likely that this game is happening at all, but it’s nice to look at. It also makes us miss our childhood. Super Mario Bros., which is the work of famed game designer Shigeru Miyamoto, is one of the greatest games ever created. If anything, for the countless developers that were inspired by the title. Metal Gear Solid creator Hideo Kojima is one such designer. The game is a classic for the generation of gamers currently in their 20-somethings. Even for a game that was created in the mid-80s the gameplay itself remains timeless. Yes, the graphics are very outdated, but even they have their charm. More recent’y, there has been a rise in popularity for the classic, 8-bit-styled games of yesteryear. Games like Mega Man 9 and Mega Man 10 have cashed in on the nostalgia of the gamers who grew up playing those games. 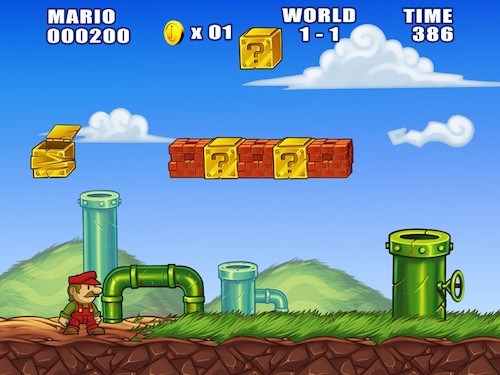 While other games take the classic gameplay elements and release a new experience such as New Super Mario Bros. and New Super Mario Bros. Wii. Other games take the classic game, and give them a graphical overhaul, such is the case with Earthworm Jim HD, Super Street Fighter II HD Remix and Turtles in Time Re-shelled. The upcoming WiiWare title Retro City Rampage, on the other hand, is a completely new franchise, with modernized gameplay and 8-bit visuals that pay homage to all the classic games. Each of these games has their own approach, and most of them do it well. If anything, classically-trained gamers enjoy the fond memories of the games of their youth. Mario-inspired art comes from everywhere, from this soda box-crafted Super Mario Bros. 3-styled piece, to this older-looking illustration that draws its inspiration from the original.